We like to think every custom-built bike that leaves our workshop is a work of art. We put in the time to understand what each rider wants, we work hard to get it done and we even apply a little bit of creative flair to each build, so why shouldn’t every one be a masterpiece? One brand that takes this approach another step further is Cinelli, the classic Italian bike brand that pretty much invented the street bike as we know it now. Since birth Cinelli has been producing amazing designs that blur the line between art and bicycles. It all started with Cino Cinelli, the father of the brand, who took his keen eye for design and applied it to bike-making. He took inspiration from all over the place, blending cutting-edge technologies and construction techniques with sharp styling and flashy paint jobs. Everything about the Cinelli approach went against the grain. Most Italian bikes then were built to the same basic requirements as they had been before world war two, and as such there wasn’t a lot of variation. Cino blew that all up by innovating constantly in the field of componentry. Even the badge for the brand (introduced in the ’70s and still used today) pretty much threw out every rule about logo design there was back then. Instead of an intricate heraldic symbol he chose the bold ‘winged C’ inspired by British ’50s artwork. Instead of a fancy font he went with a clear, simple text for the brand name. An icon was instantly born. Since then the Italian company has gone from maverick outsider doing things its own way to a trend-setting, era-defining legend – with the help of a few artists and illustrators along the way. 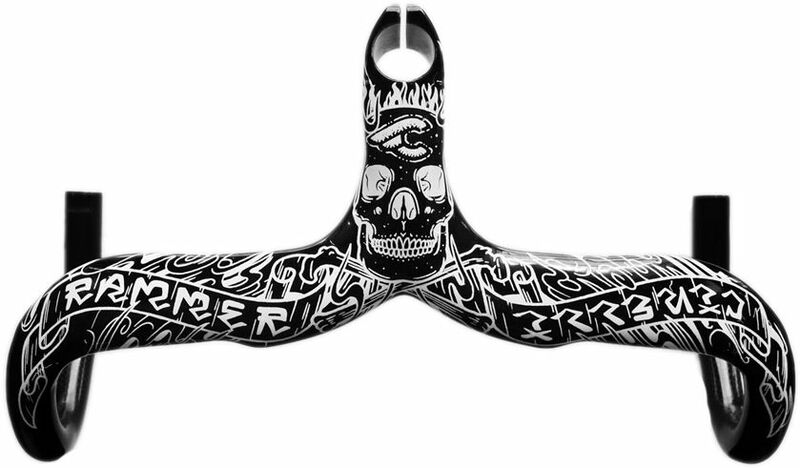 A couple of years back Cinelli teamed up with artist / illustrator Mike Giant to work on some pretty fearsome RAM bars (pictured above) as well as some matching bar tape. Before Giant, Barry McGee turned his street artist’s eye to bike design creating a super-select range of Supercorsa Pista track bikes. Then, of course, there’s that Cinelli Lazer designed by artist and activist Keith Haring, featuring disc wheels with a beautiful illustrated print. Almost thirty years old and still looking devastatingly fresh! Here’s our very own Kris posing with the fabled machine alongside current Cinelli owner Antonio Colombo at his art gallery in Milan. No matter the era, a Cinelli bike is the ultimate stylish choice for city riding. We stock the full range of frames, clothing and accessories in our stores and you can find out more info on getting your own custom Cinelli built here.